A wig is an item of postiche that covers the entire head and has many uses. In film, television and theatre, wigs are used to create characters, change the perceived age of someone or provide the right hair for period styles. Wigs can also be used everyday to cover baldness, thin hair, scars and other personal reasons, or to create decoration and interest, or for fun, fashion and fancy dress. Here’s a quick look at wig construction – what they are made of and how they are made. Wigs consist of two main parts: the foundation and the hair. Here’s a look at both those parts. A fine sheer material that comes in different thicknesses and skin colours. It has a honeycomb-shaped construction onto which hair is knotted or hand tied. Hair lace is measured in denier (yup, just like stockings!). Lace used for film/TV is 20 or 30 denier, with the newer HD lace being even finer, making it very easy to tear and it needs handling very delicately. Wigs for theatre are made with thicker lace, as it is more durable and robust. Hair lace is used where a more natural looking wig is required, especially on the front hairline, as there isn’t a hard edge. The front lace goes onto the wearer’s forehead and should blend into the skin and not be noticeable on camera, stage or even to the eye for the finer laces. Wigs made completely with a hair lace foundation is called a hair lace wig. A wig that has no lace at the front and is made with a solid edge instead, is known as a hard-front wig. A custom-made hair lace wig is the most expensive type of wig you can buy. Mono-filament is a very fine transparent mesh fabric that has individual hairs (human or synthetic) hand tied into the mesh. Mono-filament material can be used to make a whole wig, or used in key areas where the hair’s movement is more noticeable e.g. the top of the head – crown, parting, front. This is known as a mono top and is cheaper to use. Wigs with mono-filament are generally more natural looking than wefted wigs, as the filament is fine and translucent enough to not show. The hair also appears to be growing out of the scalp and the hair can be combed in any direction. 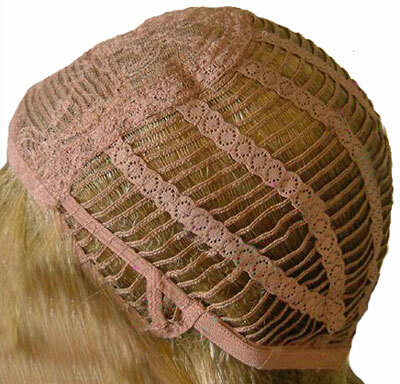 Made from rows of wefts (synthetic or human hair) that have been machine-sewn together into a basic cap. Hence, they are also known as machine-made wigs. Wefted wigs that don’t have an underlying solid cap are also known as capless wigs. The wefts of hair are sewn onto thin cotton or lace ribbons – these are then sewn together to form the wig shape. The ribbons are flexible and reasonably stretchy, allowing them to fit the wearer’s head. More expensive wefted wigs feature a lace or mono-filament inset at the front and/or crown which allows the wearer to part the wig and brush the hair any direction. It’s a very common foundation type, and is lightweight and breathable (because of the spaces between the wefts). These wigs are known as hard-fronted. Foundations can also be made from a thick mesh fabric, silicone or plastic. 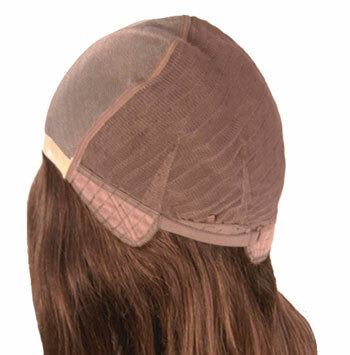 A hard-fronted wig with adjustable band to the nape, allowing for a snug fit, and tape tabs at the side. Hair used could be synthetic or real. 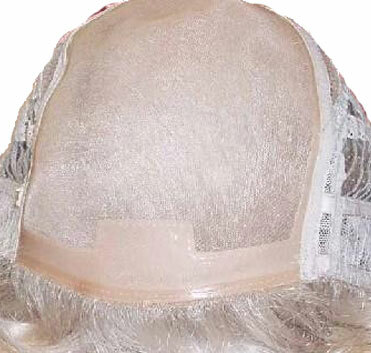 Mass produced wigs often have plastic-coated tape tabs for double-sided tape (toupee tape) to be used, allowing the wig to be secured to the head. Wigs usually have an adjustable strap and hooks or Velcro at the nape, which is used to fine-tune fitting at the back of the head. Wigs may have tiny toupee or wig clips in them, to slide into a small section of the wearer’s hair for extra security. Wigs are mainly made from either human hair or synthetic fibre. Horse hair, crepe hair and yak hair can also be used for certain types of wigs (e.g judges’ wigs are horsehair). Hair also comes in varying quality: there is good quality real hair and synthetic fibres, as much as there are cheaper options. This impacts on the look, durability and feel of a wig. Human hair for wigs comes from various places, mainly Europe (Spain, Italy and western Russia are common places) and Asia (India and China). The hair needs to be processed, which weakens the structure and can make it porous. Asian hair in particular needs a lot of processing, as it needs to be lightened in order to be coloured. Hair also no longer has a natural supply of oil, and it can become very dry with use over time. It needs caring for to preserve it and keep it from drying out and breaking. It can be washed in shampoo and conditioned, is set and styled just like real hair is, and is affected by heat, rain and humidity. It may not, however, behave exactly like hair on our heads. 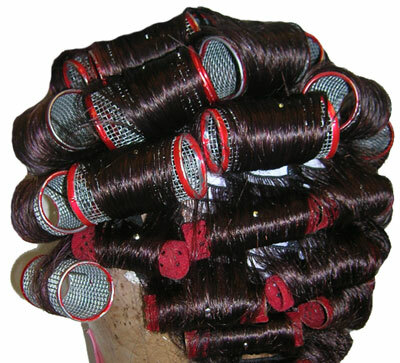 Remy hair refers to hair that still has its cuticle. A lot of hair used in the hair trade has been stripped of its cuticle. Wigs made from synthetic hair are often made from acrylic. Synthetic fibre is cheaper to produce than human hair, and can be made in any colour or length, and can be made straight, waved or curly. Synthetic hair looks less realistic than hair (especially the cheap synthetics). For the media, synthetic wigs are used for theatre productions or for background in film/TV, where close ups are not an issue. Synthetic hair cannot be coloured or permed. Some synthetics cannot be styled with direct heat – they will melt on contact with straighteners, tongs, blow dryer etc. However, synthetics have come a long way in recent years and nowadays there is artificial hair that can be heat styled. Acrylic hair can be set with steam and a low heat. For theatre, wigs are set as normal in rollers, then gently steamed (over a kettle or using a proper steamer) and left to dry. Depending on the quality and age of the synthetic, it can be easy to set and style, and it retains it shape and set better than real hair – useful for shows where there is a lot of sweaty dancing! It is tough and durable, plus it doesn’t drop or lose its shape in humidity and rain like real hair does. Horse hair is used to make judges and barrister wigs. The short white/grey wigs used in the legal system in many countries – horse hair! Wigs can be made in two main ways: handmade from scratch or mass produced on a production line. It is also possible to add a handmade element to a mass-produced wig e.g. by adding a made-to-measure front hair line. The front hairline of a made-to-measure hair lace wig. Made from theatre lace foundation and hand-knotted human hair. The hairline has been knotted with a slight widow’s peak. Normally made from hair lace and human hair, and can be made-to-measure specifically for someone. Hair lace wigs used in big budget film and TV, especially on principle actors, will be handmade by a skilled wig maker specifically for the production. They are more expensive to buy than off-the-shelf wigs. 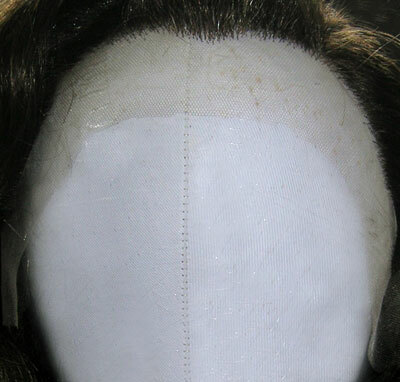 Sometimes wig makers will make generic stock to hire out to productions, though these will still be based on either an actual head template or typical head measurements. Usually made on a production line, even if there are elements of “hand tied” in the construction. Cheap hair wigs are mass produced in China on factory production lines. There are some good quality wig manufacturers too: Ellen Willie, Gisela Mayer and Raquel Welch all make good quality and affordable synthetic and hair wigs for personal use. 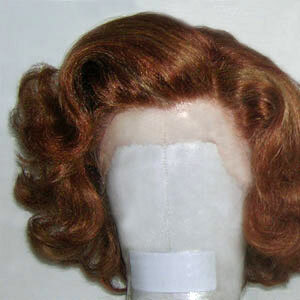 Wigs can also be made from a mix of the two processes. An off-the-shelf wig can be personalised with a front hairline that is made from hair lace and real hair, giving the wearer a better fit at the front (generally where a good fit helps the wig to be less noticeable). This alteration could be done by a wig maker. Start with a consultation about what exactly is required e.g. the hair colour(s), the length, thickness, any parting and what it is for (e.g. theatre, film, personal – as this determines the lace used). A head shape and measurements are taken from the client/actor in order to make a pattern for the foundation. A head shape is made by wrapping the person’s head in food wrap (e.g. Clingfilm) and using sticky tape (e.g. Sellotape) to create a strong template. The hair line is marked on to this with a soft pencil and covered with the tape. A foundation lace template is made from the head shape and measurements. The Clingfilm head shape is fixed to a wig maker’s wooden block. The foundation lace is cut to match the head shape, and the pieces are stitched together, creating a base for the hair to be knotted into. The hairline is tacked into the lace using a darker thread (this is removed once the hairline is finished), so the wig maker knows where to knot to. The required hair length and colour is selected. To make a natural looking wig, slightly different colours of hair will be blended, as natural hair is not 100% uniform in colour. The hair is blended using a hackle – a vicious-looking large metal-toothed “brush” that is used to mix hair colours. It also combs out the hair. The mixed hair is then placed into a drawing mat -a double-sided mat with little hooks on it (a bit like Velcro). This makes it easier for the wig maker to take a small section of hair to work with, and keeps the hair safe from being tangled or blown away. The mixed hair is knotted into the lace foundation using a knotting hook, which looks like a small crochet hook. They come in different sizes – larger ones to knot several hairs at once (for the bulk of the wig), and finer hooks for knotting single hairs, usually around the hair line. The wig is styled/cut as required, once all the hair is knotted into the wig. It is then ready for setting and dressing. Throughout this whole process, fittings with the client are good to ensure that the wig is progressing as required. So, that’s a quick look at how wigs are made and what materials are used. It’s important as a makeup artist to be able to identify wig materials and hair type, as they need to be treated differently. ← Previous Previous post: What Is My Skin Type? This is one of the best online videos I’ve ever seen. As a lace Wig-Maker myself, this is complete dreamland for me. All of those drawers with beautiful, sleek, fabulous hairs looks like complete heaven. Not to forget those rolls of lace, I only hope my skills can take me to the art of Postiche on this scale. I’d love to work for these people, wherever they are in the world. Absolutely amazing to see the whole process from start to finish. It really is quite literally dreamland for me, seeing this. I didn’t realise until now, but they’re actually following me on Instagram! Of course I’ve now tapped that ‘follow back’ button to follow their fabulous work. Thanks again for letting me know where to find them! Oh that’s great 🙂 Glad you’ve found each other. Perhaps a visit to the Netherlands is on the cards! Oh. Have a look at Hallucinating Hairlines online. I’ve bought a wig from them and the hairline is so natural. I believe It’s half machine made and half hand tied. I didn’t have to give measurements in either. My problem with wigs is that they have too much hair. Especially for an older person, less hair looks more natural. We agree Agnes – certainly with shop-bought wigs; they can be quite full and bouncy. If someone was looking at getting a wig for everyday use, would it be better to get just any old one or have one custom made? I would assume the second option since you would want it to fit well. Plus, I think it would be a good idea to choose the type of hair you want.